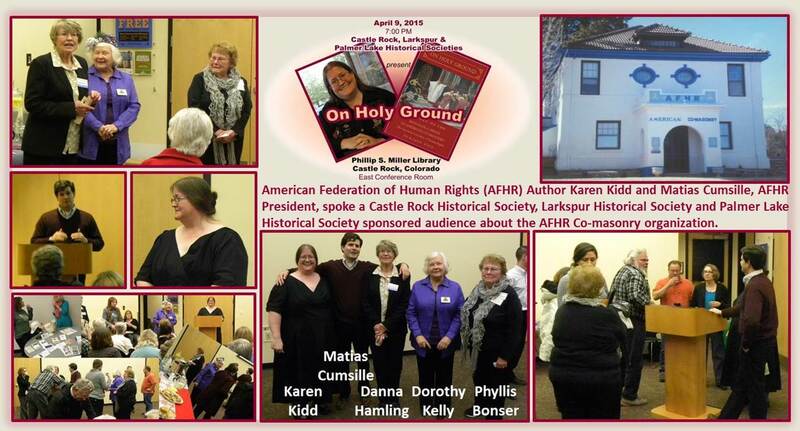 On the evening of April 9, 2015, three historical societies, Castle Rock, Larkspur and Palmer Lake, sponsored American Federation of Human Rights (AFHR) Author, Karen Kidd, speaking to the audience about the Co-masonry organization in Larkspur. The event was billed as On Holy Ground, the book authored by Ms. Kidd. The presentation was well received as Ms. Kidd spoke and answered audience questions about the philosophical and spiritual organization located in Larkspur which has both men and women members. Matias Cumsille, President of the Larkspur Lodge, also addressed the group in answering questions about the organization, its many lodges around the world and how the Co-masonry group differs from the Free Masonry organization which is entirely a different group with different focuses and comprised primarily of older male members. The event was very educational and much enjoyed by the audience.